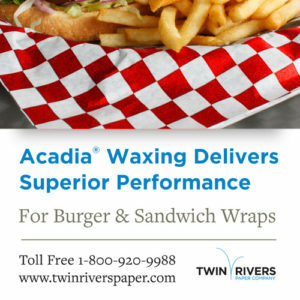 ® Waxing"> South Portland, ME May 30, 2013 – Twin Rivers Paper Company, a leader in lightweight specialty packaging, label and publishing papers, released an optimal packaging paper for dry and wet wax applications, Acadia® Waxing. These uncoated, machine-finished papers offer high absorbency for dry wax pickup and excellent holdout for wet wax pickup resulting in superior performance for common applications such as burger, sandwich and taco wraps. “Offering our customers more specialty packaging options is critical in this market. Acadia® Waxing answers this need by providing a packaging solution specifically designed for dry and wet wax packaging applications,” says Marcel Fortin, Business Development Manager. Acadia® Waxing is part of a comprehensive portfolio of specialty packaging papers that converters and brand owners trust for quality, printability and overall performance. With a wide range of basis weights, advanced coatings, barrier technologies and environmentally-friendly options, Twin Rivers’ specialty packaging portfolio is the ideal choice for today’s packaging designs.